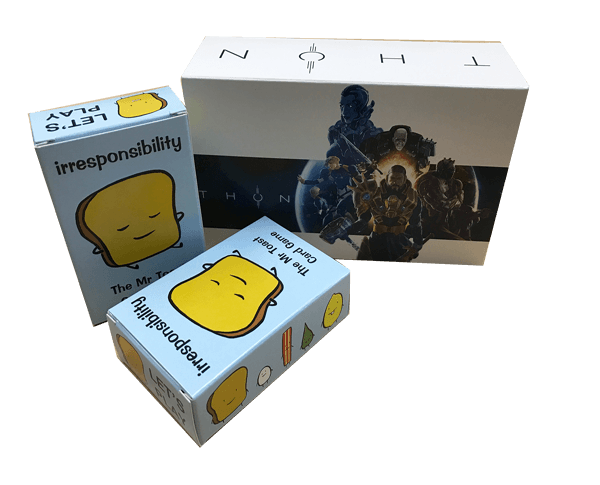 From board games, card games to video games, software for game…, you name it, Business Image Printing can help you create professional level custom printed game boxes to solve your product packaging needs. Make sure that the next big game to be sitting in customer’s homes will look just as fun and creative as the game itself by letting Business Image Printing help you make custom game box that is durable yet stylish in its design. Simply choose from our varied library of pre-made box styles or make your own box template and let us know any designs you’d like printed onto your custom game boxes and that’s pretty much the end of it. Obviously there’s many more steps than that but the main point is that all you have to do is let us know what you’d like to be made and we’ll make it just like that. With free mock-up samples and customer consultation at your disposal you can be assured that our team of experts will only take the utmost care in making sure your product has the flair and professional-grade look it needs to beat the competition. Take your product to the next level with Business Image Printing where we can create high-quality custom printed game boxes with unique, good price and fast turnaround. For more information regarding any special additional features such as spot UV coating, hot stamp foiling, or embossing, feel free to contact us for more details.